that 22oo sounds good, for what they usually use, plus, when I attached the tail two nights ago, I understand the tail heavy part of the plane, I was thinking on taking some foam board and making a floor above the braces, so the electronics can sit there, do you know about them old European Racing cars that had hinged hoods on each side, just flip them over and work on stuff? wondering if something like that should be made to get into the plane be able to get to the battery and charge it. I am getting so excited, nearing the end of my first official build, just need the electronics and finished. what in the world is a pivoted tail skid? just learned the plane had one, so how do you wire up the tail skid? I think the simplest way to do it would be to have your rudder be your tail skid. Just glue a barbecue skewer onto the rudder for reinforcement. I'm not sure of any examples to show you, but I can attempt to illustrate if you don't get what I'm saying. if you all want to learn about the Nieuport 24, here u go. @Chuppster some Nieuport 24s have the cord on the wings, what did Josh B and josh Scott use from walmart that was elastic instead of the usual cord for bi-plane wings? My dad is going back to Walmart on Saturday, thought to ask, because the wings are huge and some extra support my do them some good. Are you talking about the cross braces that go diagonal between the fuselage and the wingtips? You could use wire for that, I think Walmart would have it in the Hardware section. I used barbecue skewers on my Baby Blender and it worked really well. yeah cross braces. okay, neat, didn't know you could use skewers, always thought it was some sort of wire or cord. Yeah, they are typically a wire. It's just easier to hot glue in a skewer rather than figure out a way to mount wire to foam. For future reference the way to add functional bracing wires into the FB is simply embed a short length of BBQ skewer, (and glue), with the bracing wire, (braided fishing line), tied to the centre of the short length of BBQ skewer. The skewer is embedded in the under surface of the lower wing and in the upper surface of the top wing. Tensioning of the guy wires can be achieved in many ways. The same embedding of guy wires can be used if you are trying to mimic wing warping as roll control. Hey, I was wondering if the 2200 will be big enough, does the Flite Test store have in stock the 22800 or will the 2200 be enough power for this large bird? Also, on how they have removal hood/cockpit with the popsicle sticks, how is that built? Just watched the WarBird Mashup and those planes with the added wings didn't have enough for the 2200, just thinking and caculating. Please respond, since we are in the electronic stage of the build and building the final part of the body and would like it to be removeable when needing to get to the battery., sorry if I am getting a tad bossy or whatever, just the excitement is growing as it is finally coming together and looking like a nieuport and want things to go smoothly in the important area, electronics. The 2200 should be fine for the C-pack motor. Do you have any way of measuring what she weighs right now? Don't worry about building her to balance on the cg until you have the electronics in. The motor and battery will add a lot of weight to the nose. no, our scale got broke a few years back, but it's darn near the length of the dining room table and wider with the bottom wing on it, so it's pretty good size, only used 2 sheets of foam board from the dollar store, plus the frame I hand sketched the plan of the SE5 on shipping box cardboard that the champ was mailed in, not the carry case, but the cardboard shipping box. So how long and how wide? I am wondering if she is too big for a c-pack motor. Hard to tell without the dimensions and weight. Also, you mentioned that the lower wing was very weak. Can you pick up the airframe and see no droop or wobble in the wings and no twisting of the fuse? let me find a tape measure and see. 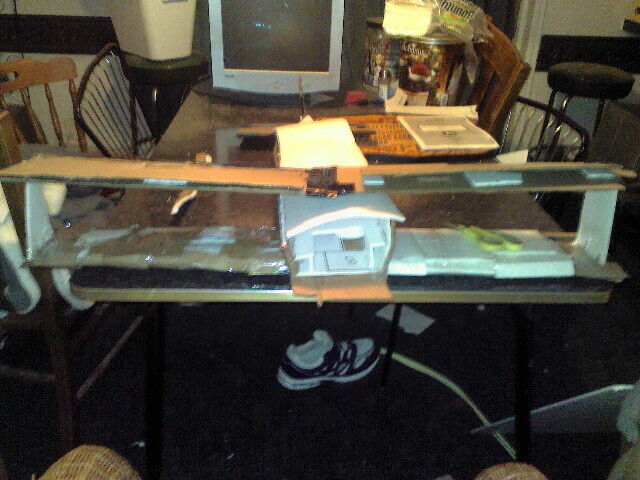 The bottom wing had some give to it, but once I put some foam on it, it became better.